Work on the board is progressing steadily. Since the last post I’ve managed to complete five more obstacle pieces for the board. Shown below are four normal, one square filling obstacles. The first one is a collection of beads and hardware store goods. The second one is a hollow wall anchor (as shown in the previous post). The third one is a container from Ainsty. It has been heavily alienized with conduit tubing and insulation paste. The fourth one is a small container from Ainsty. It has been left clean, as some parts of the reactor room will be relatively free of infestation. The fifth piece I’ve completed is a large obstacle covering four squares. I have no idea what it is. It’s built out of a toilet bowl cleaner bottle cap, two wooden IKEA furniture pegs and two small beads. It looks scifi-ish enough I think. I was even adventurous enough to try some OSL when painting it. I tried to convey the look of emergency/alarm lights, and I think it came out ok. Comments, criticism, new ideas? Hit me! Quick and easy. On a quick count, I need to make 23 of these. Since I want to eventually finish the board, I don’t want to spend an hour on each, but rather be able to churn them out at a steady rate, while still having them look nice enough. Cheap. See above. 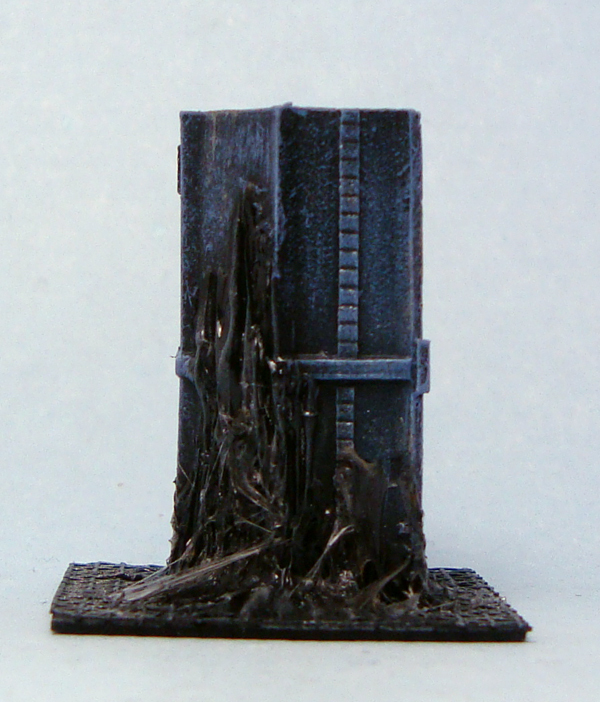 While it would be lovely to have 23 exquisite resin terrain pieces, I’m trying to keep my costs down. Large enough to block LoS. In the board game, all obstacles block line of sight. Me being something of a pedant at times, I didn’t want obstacles so small that I couldn’t see them blocking line of sight. These guidelines were easy enough to follow. So far I’ve constructed three pieces, and I’m happy with all of them. The first one is composed of a hollow wall anchor, available from hardware stores for a few euros per a bag of four or five. 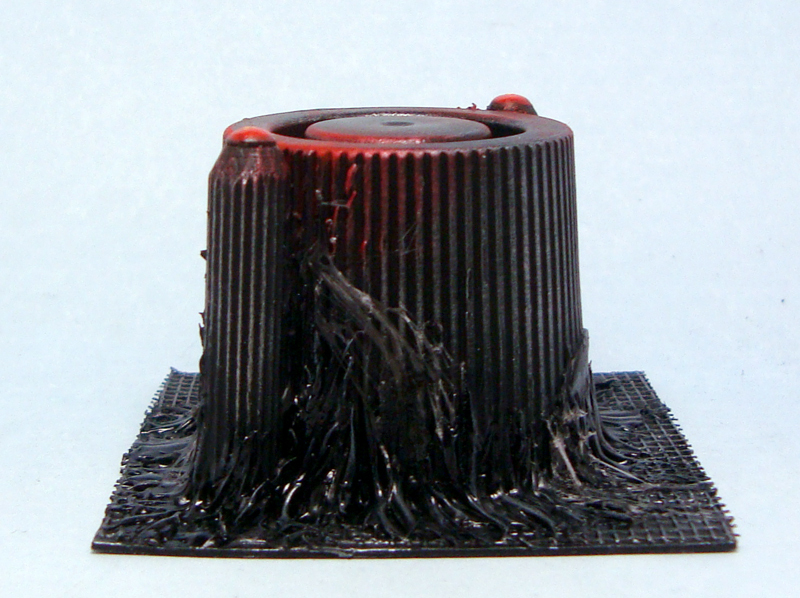 I removed the screw in the middle for an instant scifi-industrial looking structure. Next I added on some electrical wire and conduit tubing, applied a liberal amount of insulation paste and left it to dry. I then sprayed everything black and gave the Alien goo two drybrush layers of grey (GW Codex Grey and Fortress Grey) followed by a black wash (GW Badab Black). The visible part of the wall anchor was given a drybrushing first with VMC Oily Steel and then VMC Natural Steel. I finally gave the Alien parts a layer of gloss varnish for a wet look and to create more contrast between the alien and the man-made. The final step was to add a few drops of Scotch universal glue gel. As it began to dry, I stretched it around with a toothpick to create strands of that sticky resin the Xenomorphs tend to leave around, the messy critters they are. The second one basically consists of a resin container from Ainsty. 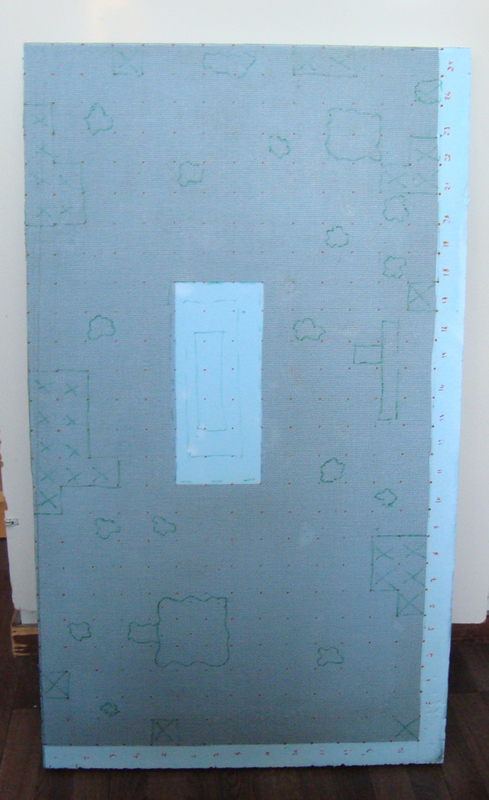 I simply glued it on a piece of magnetic sheet, which I’d covered with plastic bug screen to match the game board. Some insulation paste was added to Xenomorph it up a bit. 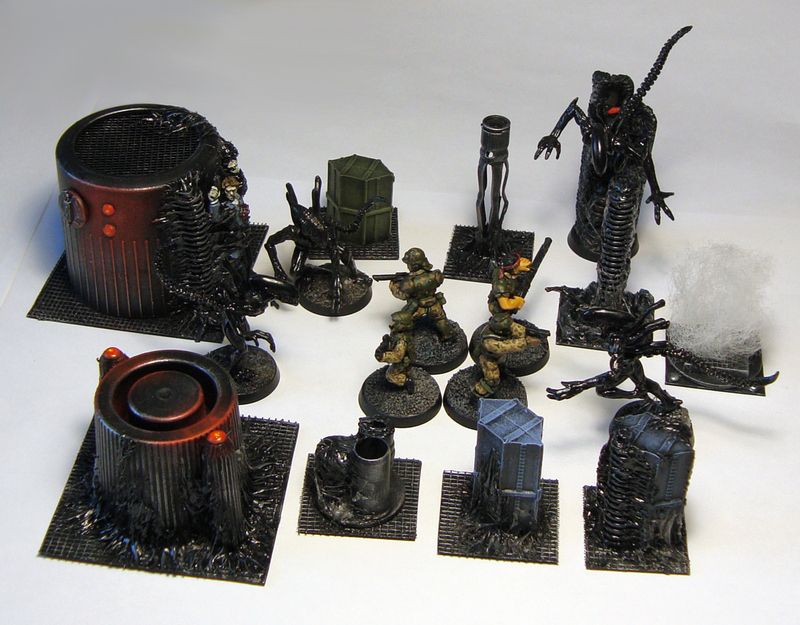 Again I sprayed everything black, and then drybrushed the container with a suitable colour (GW Shadow Grey), and painted the Alien stuff as above, with the same gloss varnish treatment. While this piece is generally more expensive than the previous one, I happened to have the Ainsty bits around already, so I didn’t have to buy new stuff specifically for this. 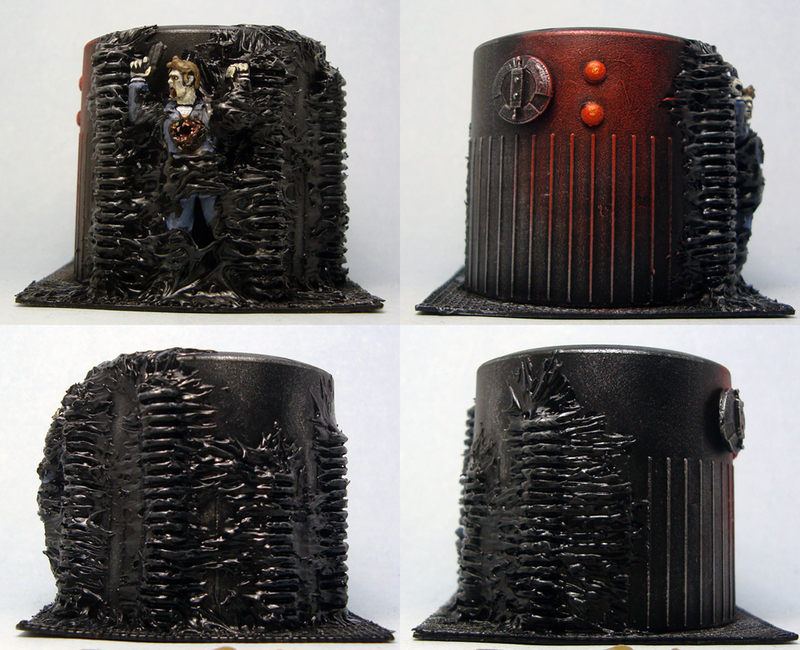 The third terrain piece is a very simple, cheap scratchbuild. Like all of my hive accessories, there’s a square piece of magnetic sheet. On that I glued a 30mm stainless steel washer. 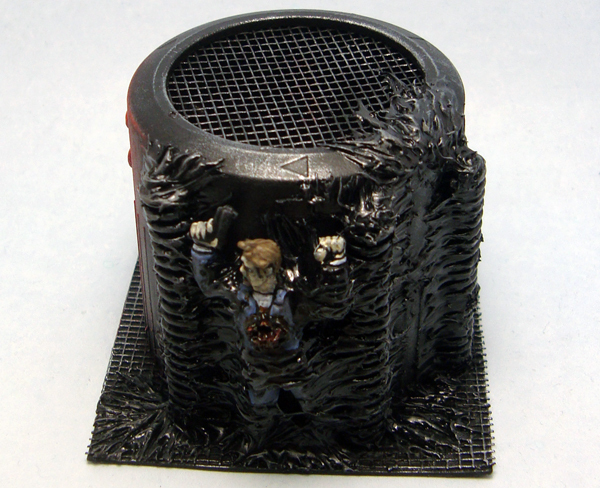 On top of the washer I glued a plastic base from a Mantic miniature, and covered that with a small square of bug screen. I then glued four beads in the corners to look like rivets. Once more out came the black spray, followed by painting the steel like above. There was one problem, however: guideline #3, the line of sight one. Nice enough as it was, there was no way that flat ventilation thing would block line of sight. However, as I’m a clever little monkey, I’d taken this into account! 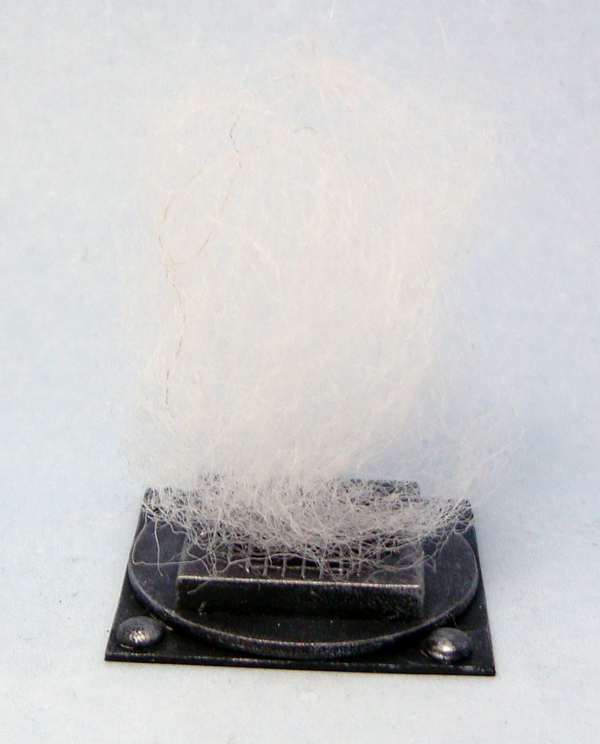 I glued some white craft wool to the grid to represent steam billowing up (sadly not too visible in the photo), and gave it a spray of matt varnish to keep it in shape. Quick, easy, cheap as chips and guaranteed to block your LoS. Here’s a final shot comparing them with a Woodbine miniature. I think they look fine. Opinions? I just completed these five models. They were specifically painted for my Aliens board game project. 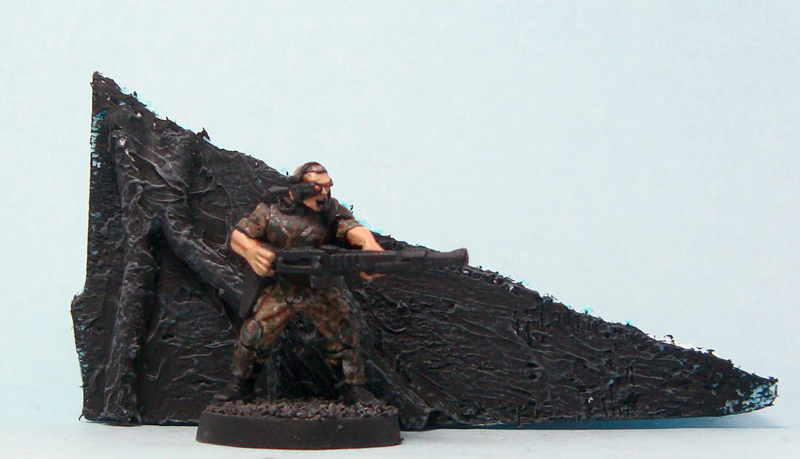 What these five models reminded me of is that I [expletive] hate batch painting. 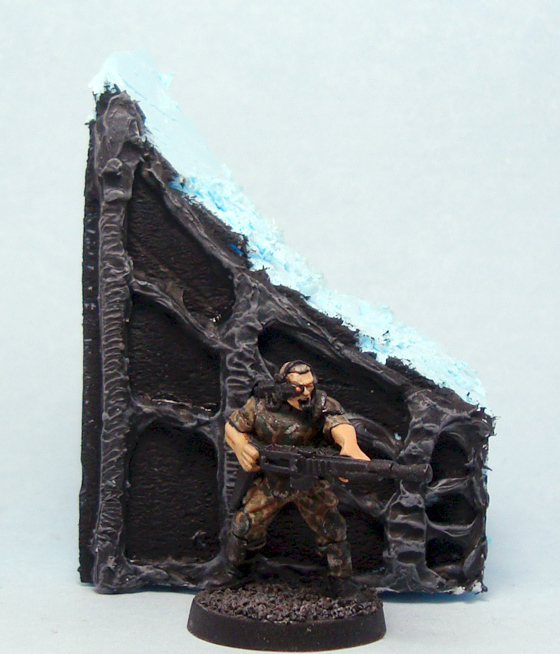 It’s dull, it’s dreary and it takes most fun out of the area of the hobby that I enjoy most – painting. After much eye-rolling, cursing and exasperated sighs, they’re finally finished – luckily they turned out alright. 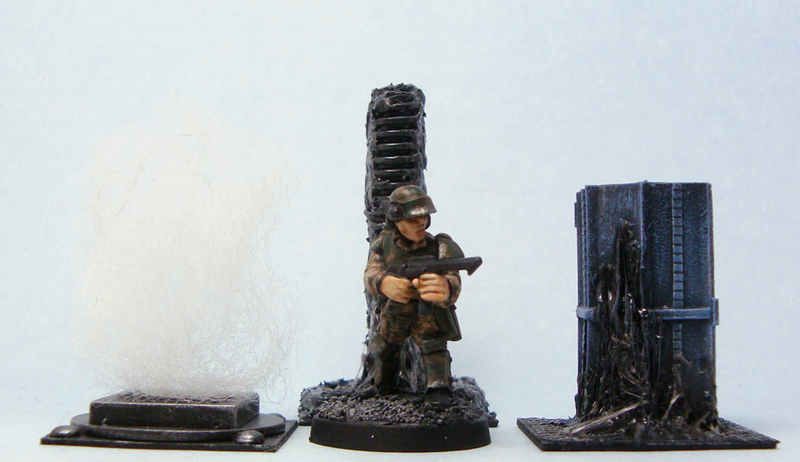 All miniatures except Frost (holding a pistol), who is a conversion of an em4 plastic trooper, are Woodbine Colonial Marines. 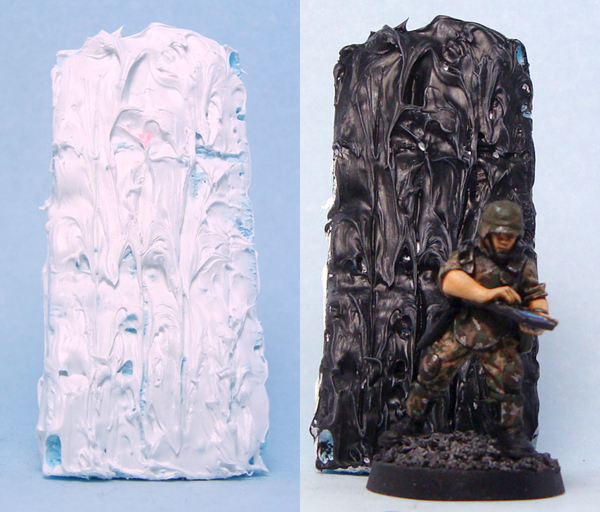 They were nice enough to paint, and I pretty much just followed my regular recipe for painting CMs. 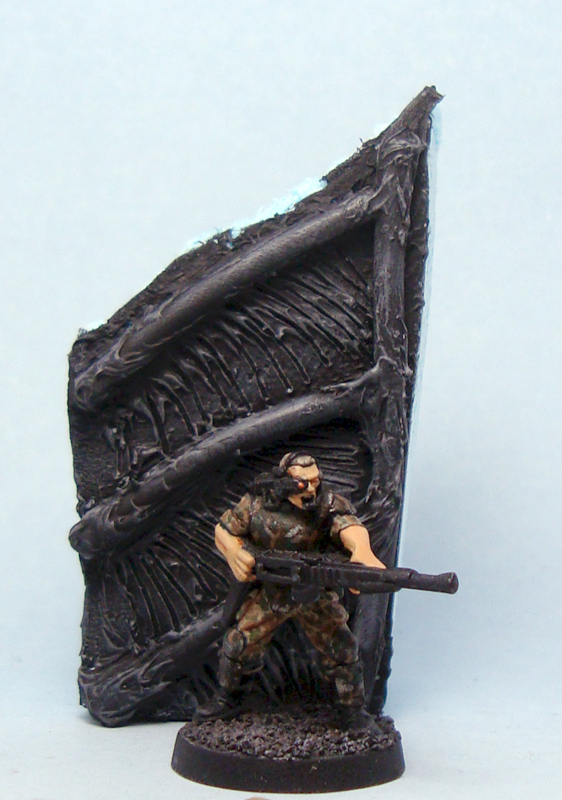 I’m quite happy with how some things turned out, such as Vasquez’s darker skin colour. Some of the teeth sculpted on the models make them look a bit squirrel-ish, but who’s counting. With all the minis I need for the project now finished, I can move on with the game board as well! After my last post I’ve received very good comments regarding the hive walls. I agree that the first test piece was lacking that biomechanic look so iconic to the Alien franchise, so I went to work on different prototypes. I bought some electrical wire (as it’s very cheap and holds its shape) and using blue foam offcuts and Tetra paste I knocked together three prototypes for hive wall styles. I’ve shown them painted, with everyone’s favourite smartgunner Drake for comparison. What do you think? They’re still lacking all sorts of lumps, holes, glue-goo, gloss varnish, ribbing and things like that, but these should give a rough idea. None of them are quite right, but I have a feeling I’m getting there. They are a bit sparse, for one, so I really need to add a lot more stuff in. First test – While I like the spinelike ribbing on the vertical struts, I quickly noticed that the background desperately needs texture. It’s also a bit too spider web looking. 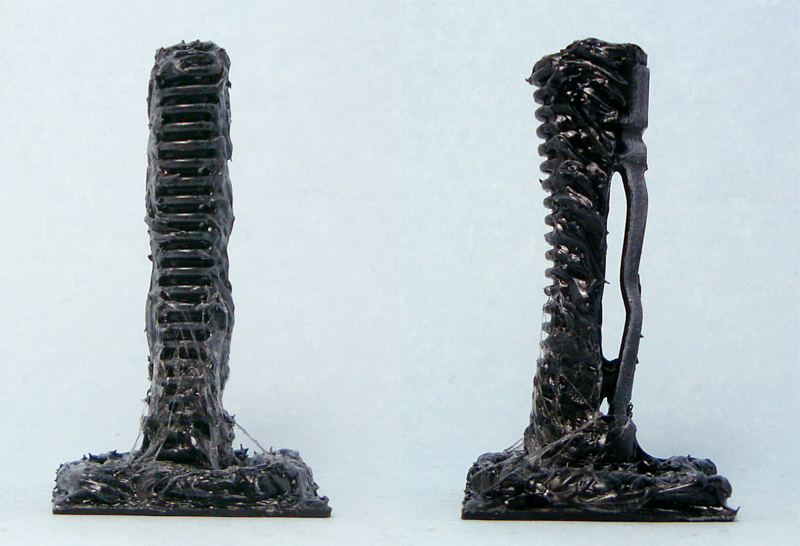 Second test – In this one I like the organic look of the tubes. It’s much too sparse, though. The addition of a simple texture to the wall makes a huge difference. Third test – In my opinion this is the most Gigeresque of the test pieces. I like the ribbed texture on the wall. A lot of the wire was left exposed to create a smooth look. 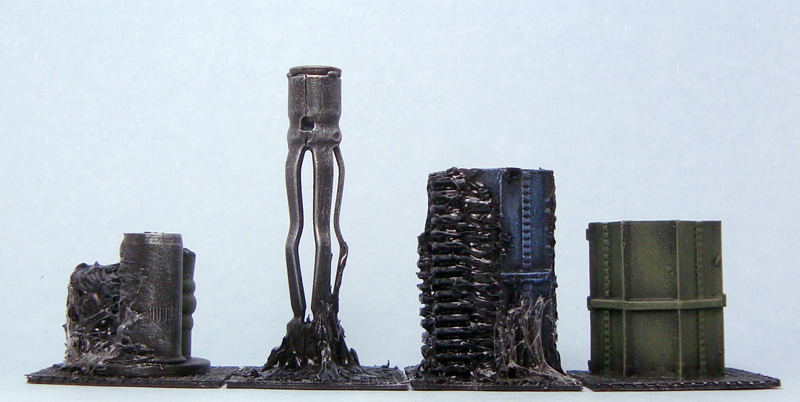 I used some heavy drybrushing to emulate Giger’s airbrushed style. In my own opinion there are good elements in all of them that could/should be combined. I hope you’ll agree that these are much closer to H.R. 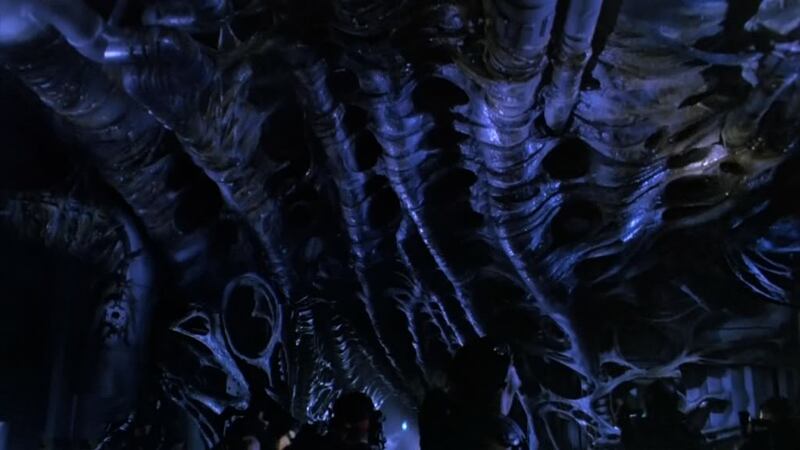 Giger’s aesthetic than my previous outing. There are two styles of hive wall that I’ve spotted in the films. One is a very random, swirly, gooey one, whereas the other one is very much straight-off Giger with less “bio” and more “mechanical”. 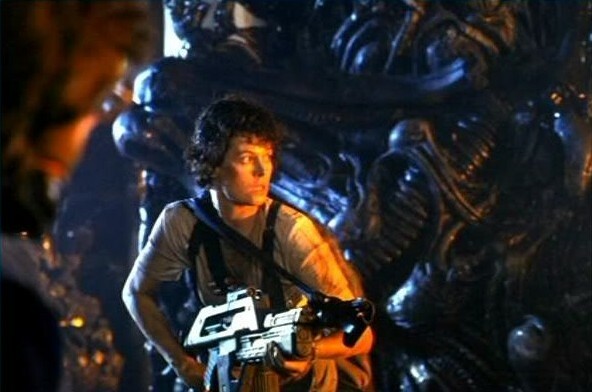 Here are some shots from Aliens to illustrate the look I’m trying to achieve. 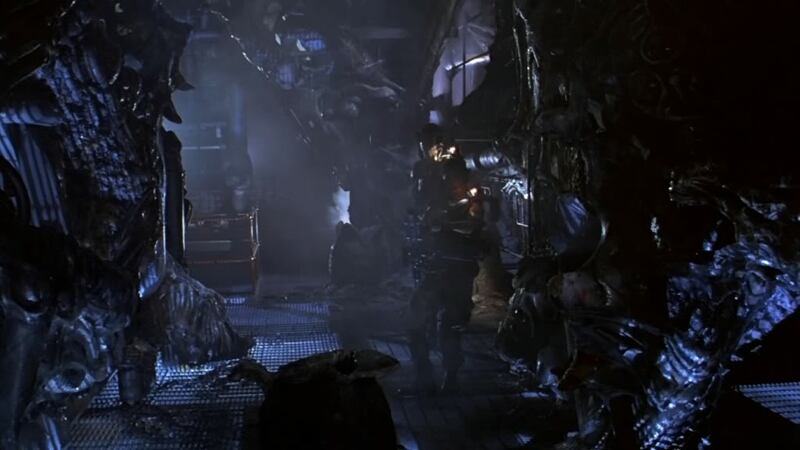 There’s obviously a lot of randomness, as well as plenty of organic looking strands of Xenomorph resin. Of course I’ll need to leave some original walls showing through as well to create a contrast between the man-made and the alien. Now’s the time for comments. As you can see, I’m teetering between different options so input is very valuable at this time. Don’t be afraid to be critical, either!